Some plants naturally grow in water, but most land-based plants (including cannabis) naturally grow in a soil which provides the plant’s roots with the minerals and nutrients needed for the plant to grow and thrive. The first written record of growing soil-bound plants in a soilless environment was probably by Francis Bacon in his book Sylva Sylvarum which was published in 1627. By the early 1700s, there were several researchers using a “water culture” methods of growing. At this point water culture was used mostly for research because we weren’t really sure exactly which nutrients and minerals plants needed to survive. Water culture techniques were used with various nutrient solutions to try to figure out the mysteries of plant growth. In the 1850s and 1860s, two botanists from Germany developed a water culture technique which involved bubbling air through a nutrient-rich solution of water. These researchers, Julius von Sachs and Wilhelm Knop, were some of the first people (we know of) to grow plants like this – a method we would now consider to be DWC (deep water culture). At the time it was known as “solution culture” because a specially prepared solution of water and minerals were used to provide nutrients to the plants. Sometimes you’ll still hear growers today refer to hydroponic growing as a solution culture. 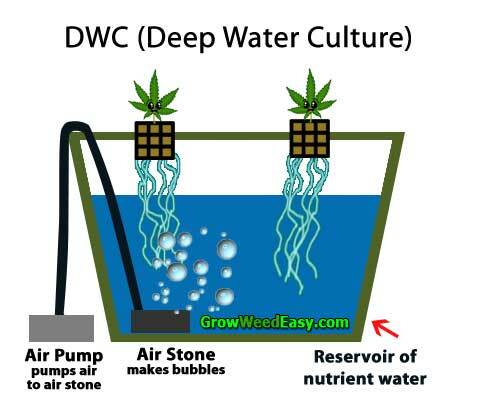 Note: The basic DWC technique was originally used to determine exactly which nutrients are needed by the plant for healthy growth. It’s still used today by modern botanists and plant nutritionist while doing plant research. It wasn’t until the 1900s that people began to realize the power of hydroponic growing for achieving bigger and faster growth. After we finally began to understand which nutrients a plant needs to grow and thrive, we discovered that growers who provide the right conditions at the roots can achieve rates of growth that are faster than soil-growing methods. Unlike growing in soil, hydroponic growing allowed growers to control almost all variables for the plants, allowing them to provide exactly what plants need at the exact right time. The term "hydroponics" (which loosely means “labor of water”) was first used in the early 1930s and the name has stuck ever since.